The Ergohuman Plus Elite chair is a perfect fusion of art and science, with flex zones that ensure constant support of back and lumbar, multi-dimensional adjustable arm rests for unparalleled support and a height-adjustable pivoting headrest for full cranial support. The Ergohuman has been designed specifically for those who are in an office chair for long periods of time and require "Intensive Use Seating" for comfort. The Ergohuman Plus Elite boasts all the main features of the Luxury model but with reduced aluminium detailing and without the seat forward tilt to target a wider market. 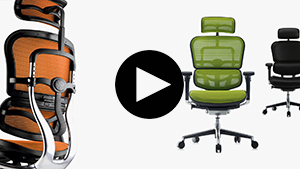 Click on the links below to view the different functions available on the Ergohuman chair. Elevate beyond the ordinary with the Ergohuman’s stylish, organic curves and incredible comfort. Ergohuman can be personalised to suit any workspace. Go executive with leather; striking with a combination of our bright, modern fabrics; or mix fabrics and mesh for contemporary comfort.